I’m not going to give you some long-winded blog post on this one. This one is easy. 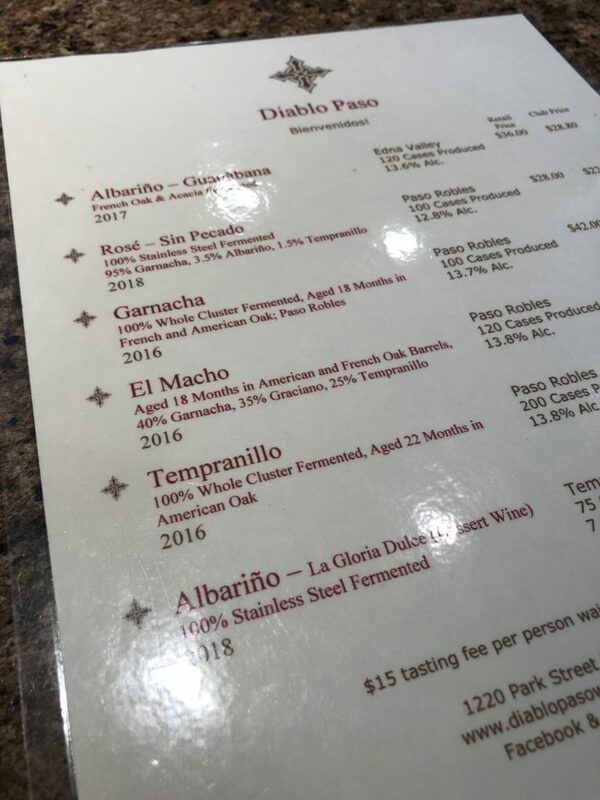 We have never tasted Enrique Torres’ full line-up of wines but I know we’ve tasted one or two here and there in the past so it was good to get in to his tasting room and even better that he was there to chat with. The tasting room was once the home to Edward Sellers wines and then Parrish Family Vineyards. It’s a good size tasting room right near the downtown park. The wines were very good. And most importantly, Enrique is one cool cat with a very interesting story and history. You can learn a little bit about that here: http://www.diablopasowines.com/our-story.html . As I said above, we really did enjoy the wines. We encourage you to get in there and see for yourself. My gut tells me you won’t regret it. Thanks again to Enrique!